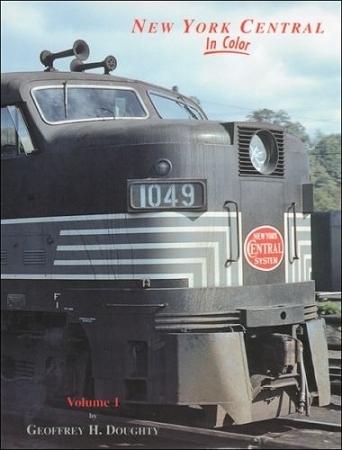 An all-color tour of 40's, 50's and 60's steam-diesel action all over the Central -- drawn from many collections. Warning: The Surgeon General has found this volume addictive. Do NOT take this 2001 book for granted, Morning Sun will probably not have another printing and stocks are already probably getting low. We now return you to our regular book description. Passenger train expert (and NYCSHS member) Geoffrey H. Doughty presents the New York Central as it existed in the 1940s, 1950s and 1960s. With access to many slide collections, Doughty shows branch lines, yards, and making speed on the main line,.. in other words, a railroad hard at work, doing what it does best, moving products and people, in all sorts of weather, during corporate calm and corporate upheaval. The photos depict a railroad characterized by exceptionally fine passenger trains operated by well-trained professionals, backed by proud tradition, and swiftly rolling freight trains. This book not only shows the railroad as the public saw it, but also to reveals sides that many did not pay particular attention to. Introduction, pp. 3-7; the margins aren’t big as Doughty presents a quick history, a system map, and some advertising. The Hudson Valley, pp. 8-37; steam, diesel and electric at Harmon and working through excellent scenery, enjoy! The West Shore, pp. 38-48; watch a freight line with commuters. The Mohawk Valley, pp. 49-59; the heart of the railroad concluded with a few shots in the Adirondacks. Boston and Albany, pp. 60-67 ; watch Alcos battle the Berkshires, includes a dramatic two-page spread of the New England States departing Albany. Michigan Central, pp. 68-73; a “skimpy” view of a great railroad covered in more detail in later Morning Sun volumes. Check out Mr. Young's experimental passenger trains. The Big Four, pp. 74-97; another wonderful road covered a little better than the MC. Lots of steam, Bellefontaine with manicured bushes, towers, stations, Avon's hump yard, … and more steam! Toledo, Ohio, pp. 98-115; a cross-roads in the diesel era, with some dramatic shots. Along the Main Line, pp. 116-128; steam and two diesel generations on the fast tracks west of Toledo. Conclusion: For one book coverage of the entire NYC, this book has it all! Morning Sun Books, hardcover with dust jacket, printed in China, copyright 2001, 128 pgs., 8.5 x 11 x .5 in., abt. 225 color photos with expert captions. NYCSHS members who are signed into their Collinwood accounts will see pricing at 20% off list; Ohio residents must add 8% sales tax.